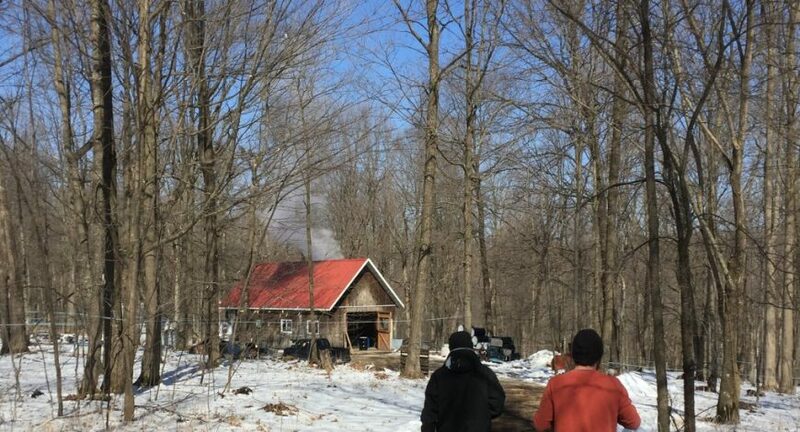 It’s finally maple season and our farmers are hard at work in the woods harvesting sap and rendering syrup. Earlier this week, we went out to the woods of founder Cecil Wright to have a tour and witness the hot-packing of the season’s first batch of syrup. 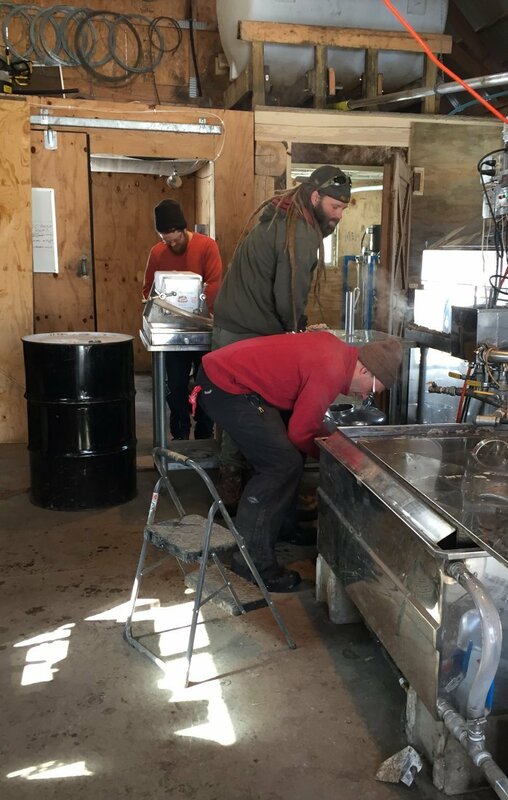 Three of our farmers; Jim, Eric, & Cecil; work together on this sugarbush. All three were there to give us a tour and show us around the sugar shack. The sun was bright and the day was warm; a perfect day for a hike in the woods! The sugar bush is located at the end of a long gravel road only about 15 minutes from our headquarters in Cashton, WI. It’s neighboring property is a state reserve and the forest has been practically untouched for hundreds of years. 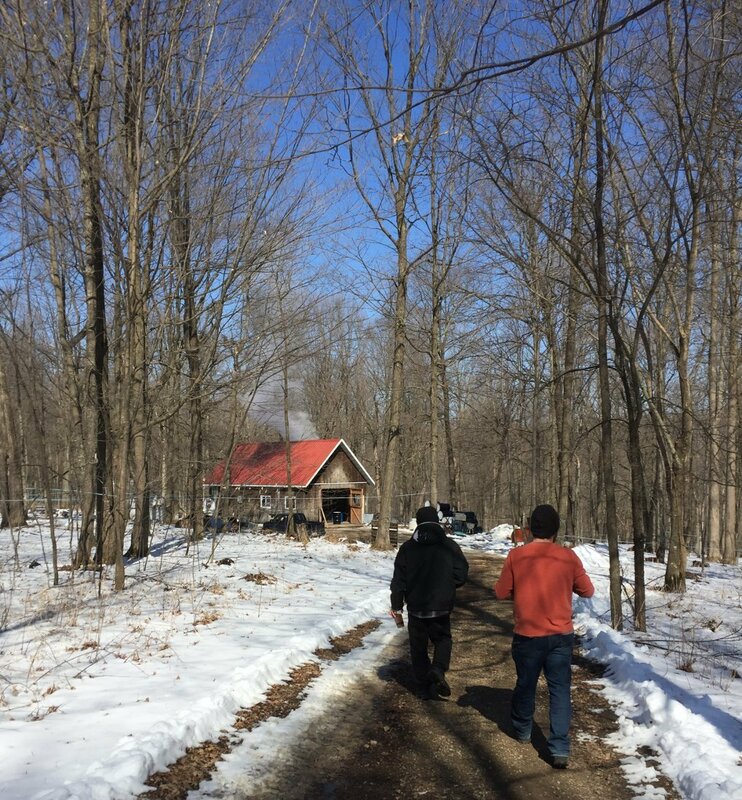 To get to the sugar shack, we walked down a short driveway and into the woods. As we approached the red roofed shack, we could already see the steam coming from the chimney. It was a sure sign that the sap was boiling. Our day started with a presentation from farmer and employee Jim Neidel. 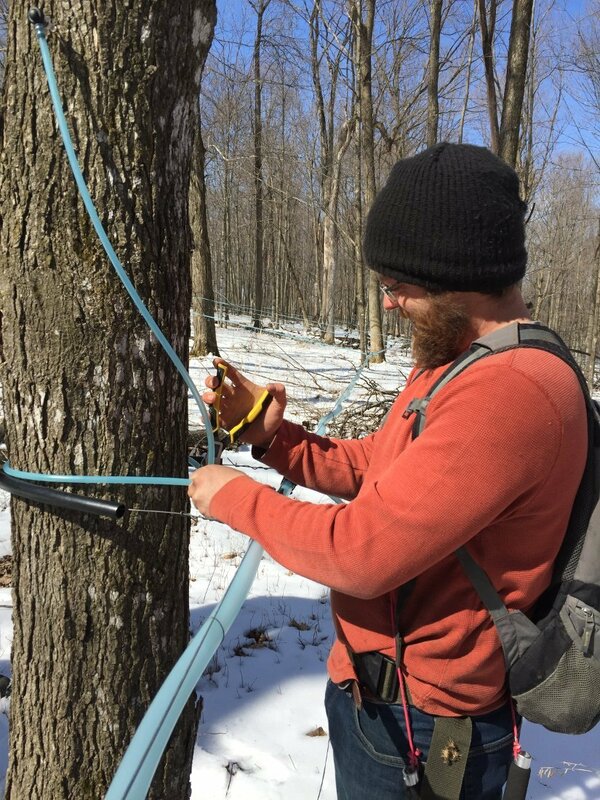 He began by showing us the tubing that is used to funnel the sap from the trees to a central storage tank. He explained to us that there are two slightly different versions of the tubing, one with more flexibility than the other. 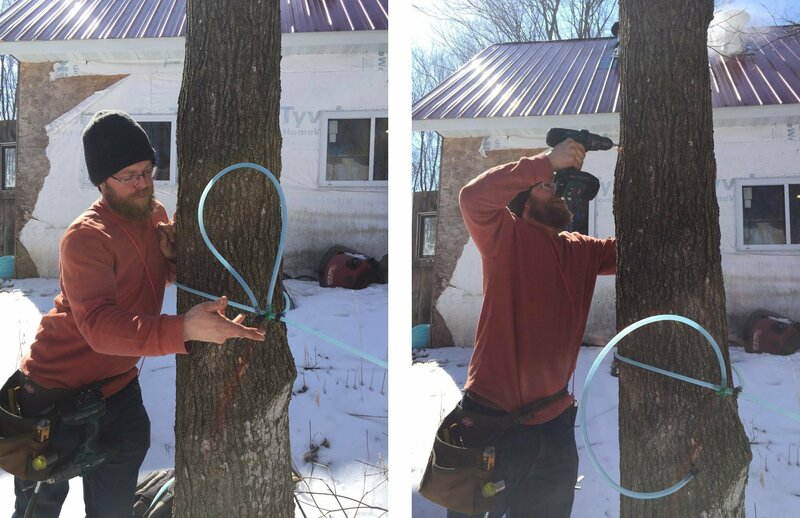 The more rigid tubing is used between trees while the flexible version is wrapped around the tree and attached to the tap. Jim also showed us a special clamp that is used to attach tubing to fittings. 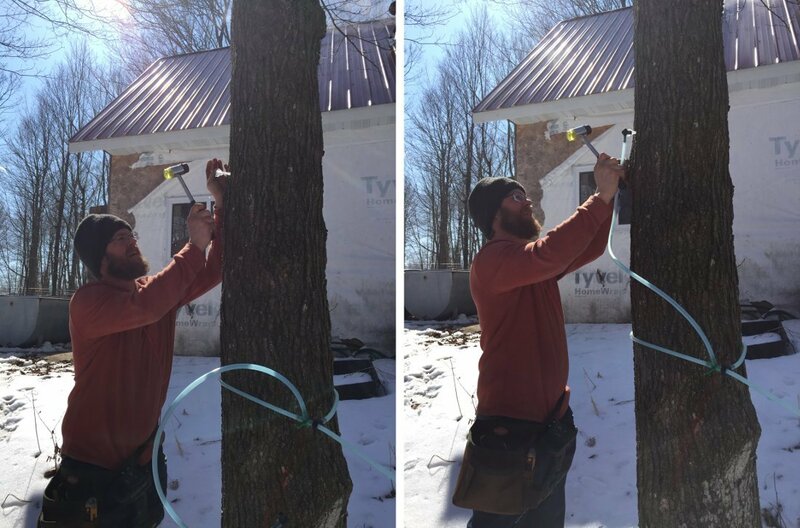 This tool was developed specifically for maple farmers. Each side has a locking vice that holds tubing in place. The tool closes to pull the two sides closer together and onto the fitting. To learn more about the tools of the trade, check out our article here. 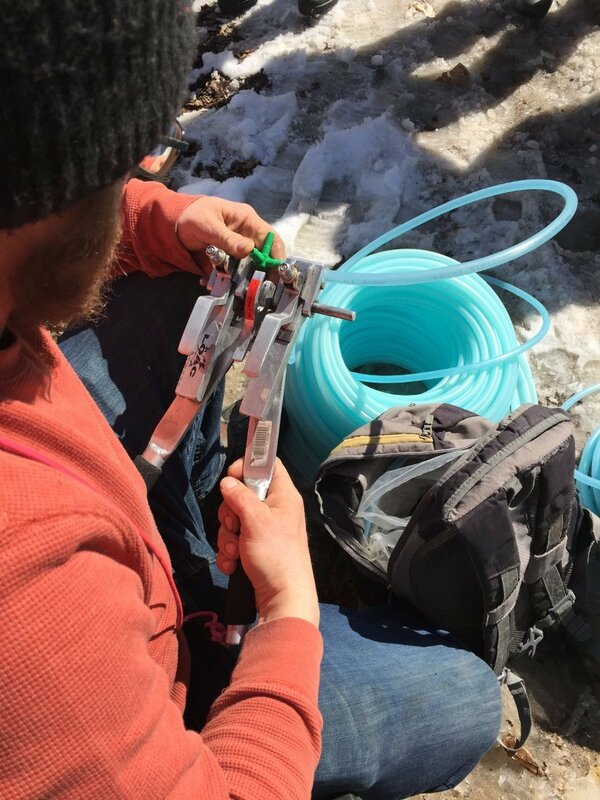 After this brief demonstration, we followed Jim deeper into the woods so he could show us how new taps are placed. First, a tree to be tapped is selected. The nearest connection point is located and cut to add new line. In this case, it was a nearby tree that was connected to a larger line. The old tubing is cut and replaced so the new line can be attached. Flexible tubing is wrapped around the tree to support the line. This tubing used as support only and does not contain sap. Jim told us that squirrels & deer will sometimes chew on these lines. A new T fitting is placed at the intersection so a new line can be stretched over to the tree that will be tapped. Once the new line is sent over to the new tree and a loop is made to support it, a tap must be placed. Jim explained to us that a special drill bit must be used to fit the tap and ensure the hole does not go too deep. The hole is drilled after ensuring that it is far enough from any healed tap holes from previous years. The hole must be straight and clean. 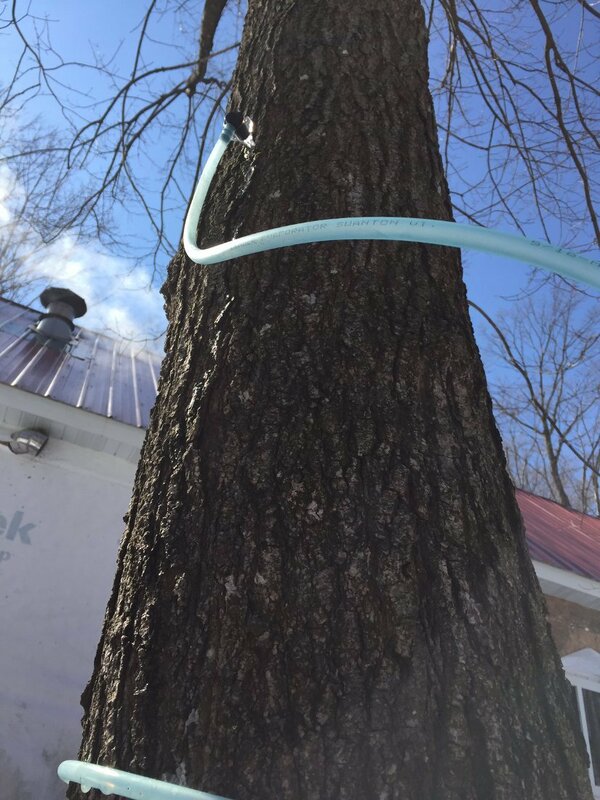 As soon as the drill was removed, clear sap started to trickle out of the tree. We tasted it, and it had a very slightly sweet flavor. Finally, Jim gently hammered the tap in to place. The tree was now attached to the main network and sap collection could commence. Once the tapping demonstration was complete, Jim took us for a downhill hike into the valley. 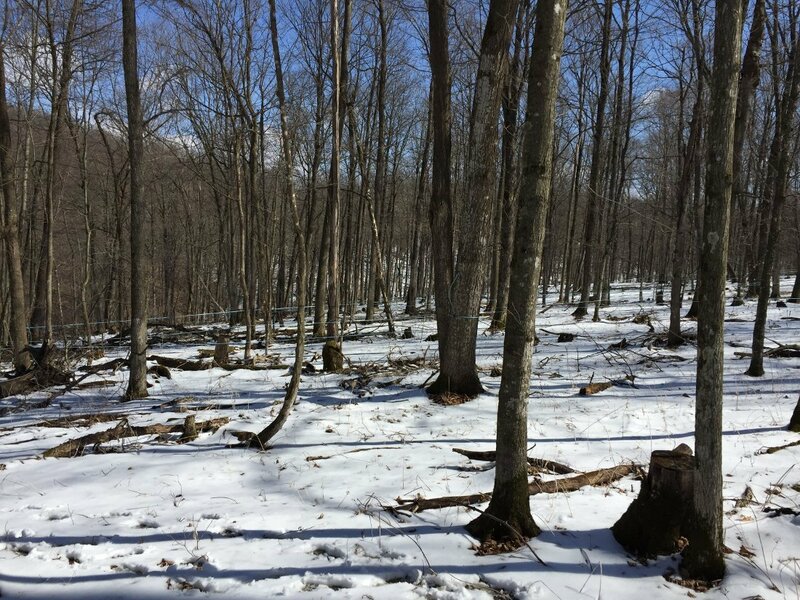 The sugar bush consists of 40 acres of forest. Many of the trees are over 150 years old. Jim explained to us that the trees grow very slowly, but you can estimate the age of the tree by its size. He showed us some simple tricks that help farmers get an idea of the size of the tree. Smaller trees can be held up to hand-spans to estimate the size and age of the tree. 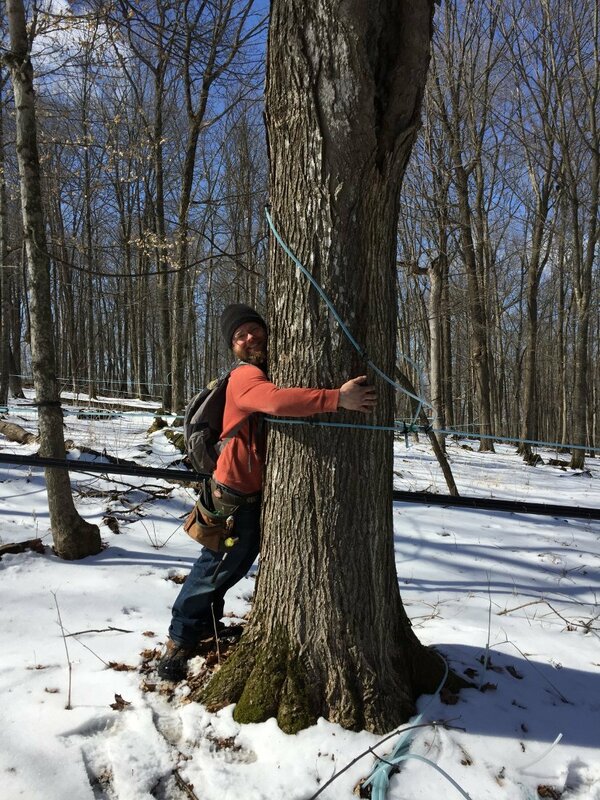 Larger trees need to be hugged. 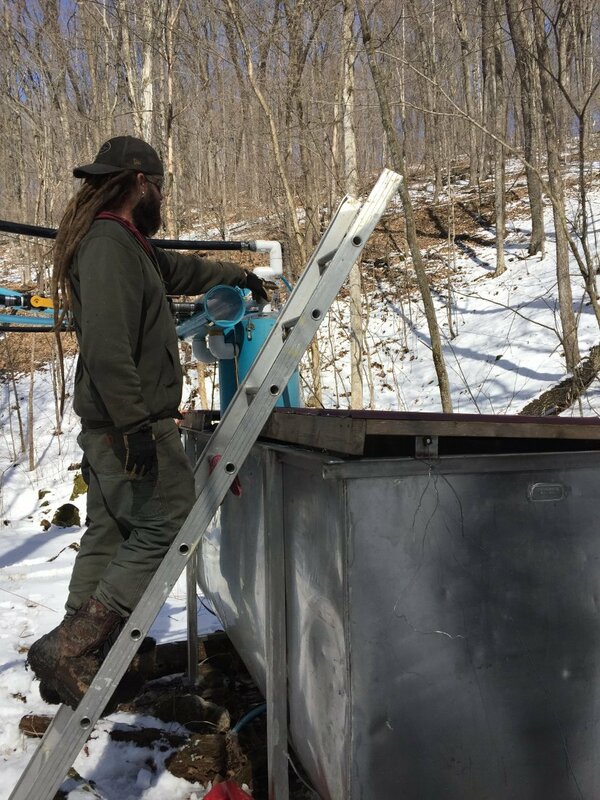 At the base of the hill, farmer Eric was waiting to show us the tank the sap flows in to. All of the lines flow into two larger tubes that funnel into this tank. This tank has a releaser on top of it into which the sap funnels. As the releaser fills up, a float is activated that empties the full one into the larger tank and begins filling the empty one. 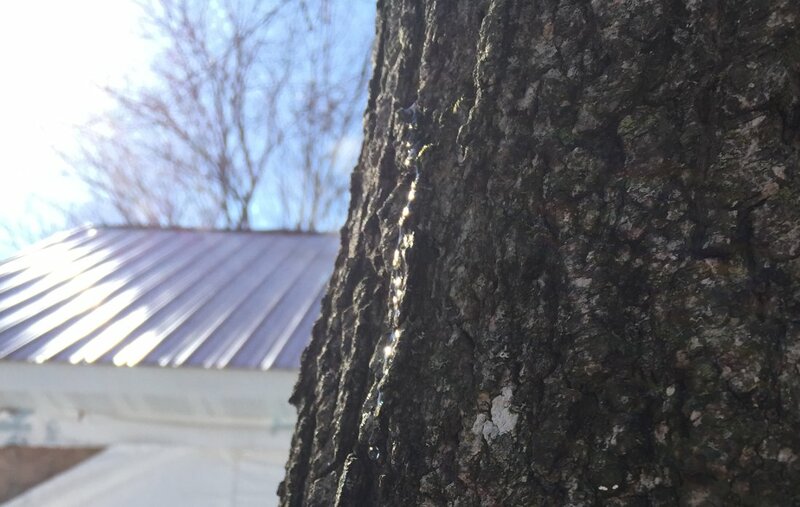 These alternating bursts of sap can be entertaining to watch. The sap from this tank is sent back to the sugar shack through a tube using a pump. There is it boiled down until it reaches a standard sugar percentage. It is then ready to put in to barrels to be sent to our headquarters for bottling. When we had made our way back to the sugar shack, we were lucky enough to witness the first barrel of the year being filled. Cecil, Eric, and Jim all hustled to get the barrel and filter ready. Syrup is filtered through a many-layered filter that also utilized DE to remove impurities. From there it flows into the 55 gallon barrel. Look at that golden syrup flow! We also got to sample some of the syrup. It was delicious! It’s going to be a tasty year!